Virtuoso cellist, respected conductor and gifted composer, Jacques Offenbach's long and notable career survived both fame and bankruptcy. As a cellist, he was known as one of the most gifted of his time. He promoted his own works as a conductor and helped define the genre of operetta in the world of opera and high art. Born Jacob Offenbach on June 20, 1819 in Cologne, Offenbach began to explore musical endeavors at a young age studying first the violin. At age nine, he began playing the cello and quickly became a proficient musician, playing in a family trio with his brother Julius and his sister Isabella. His teachers included Joseph Alexander and Bernhard Breuer. Offenbach's musical training was further developed when he entered the Paris Conservatory at 14 years of age. It was here that he adopted the name "Jacques." After leaving the Conservatory, he continued his cello studies with Louis Norblin. Offenbach supported himself by playing in the orchestra of the Opéra-Comique. Here he learned about the style of opera that he would later come to define and studied composition with Halévy. By 1833, he had become one of the finest cellists in all of Europe and embarked on a concert career, performing with such notable musicians as Rubinstein, Liszt, and Mendelssohn. Offenbach converted to Christianity in 1844 and was married that same year to Herminie d'Alcain. Offenbach's first conducting post was at the Théâtre Français in 1850. This was a unique opportunity for him because, starting in 1839, he had begun to compose larger works for the theater and was now in a position to program and produce them himself. Five years later, he resigned this post for bigger positions and continued to program his operettas in important venues such as the Bouffes-Parisiens at Salle Marigny. In 1858, Offenbach scored one of his biggest hits with the operetta Orphée aux enfers (Orpheus in the Underworld). His success continued for another ten years with brilliant efforts such as La belle Hélène (Beautiful Helen 1864), Barbe-bleue (Blue Beard 1866), La vie parisienne (Parisian Life 1866) and La Périchole (The Street Singer 1868). When this early success began to wane, Offenbach went into bankruptcy and in 1876, decided to travel to America with new productions of his operettas to aid his financial situation. 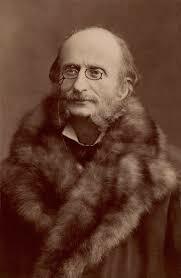 Offenbach continued to compose until the end of his life on October 5, 1880. His last opera, Les contes d'Hoffman (Tales of Hoffman), is his most famous even though he left it only in piano score. Guiraud later orchestrated the opera at the request of the family. Jacques Offenbach's contribution to the genre of comic operetta is extensive. His influence can be seen in the works of Johann Strauss II, Lehár and Sir Arthur Sullivan who, like Offenbach, traveled to America to present his operettas. Indeed, the genre of the American Musical Theater owes much to the genius of Jacques Offenbach.